Visitors of the garden need to go through a hiking trail from the base before entering the garden itself. This way, cars and other public transportation will not be allowed to enter the vicinity in order to further preserve the garden’s natural environment. The trail is a combination of rubble steps and paths that allow visitors to ascend into the hills in a comfortable and shaded environment. Know though that this might not be the best place for people who have a hard time climbing uneven steps. Upon reaching the highest point of the garden, you will see the Lanyang Plain and Pacific Ocean to your north while the Xinliao Falls and Mountain as well as the Jiuliao Falls are found at the garden’s back. Other major areas found at the garden include: Oriental Garden Plant Quarter that includes a Tang Dynasty-inspired garden, a Taiwanese garden, a Japanese-style garden and a cherry blossom path; a Western Garden Plant Quarter with a French Court garden and a British natural garden; a Maritime Age Non-native Plant Area; a low-elevated forest industrial area with a Taiwan acacia forest; a Green Center Plant Quarter with a four seasons garden square, a green fencing plant demo area, a fern demo greenhouse and a green classroom; a Garden Entrance, which includes parking areas, a transit station, a phoenix flower path, fragrant plants and an herbal medicine area; and finally a Jurassic Forest Reserve Area with a forest trail, a forest observation circle and a forest-like classroom. Today, the Renshan Botanical Garden has great hiking and recreational facilities proving it a good attraction for those who need to get away from the city for a day. Hundreds of eager hikers head their way to the garden either to embark in a tedious hike around the garden or to slowly pace themselves for a leisure walk. Because the Renshan Botanical Garden is located not far from Yilan City, transportation to the garden is very convenient. For those coming from Taipei, take a train or bus headed to Luodong Station and then take a 25-miute cab ride to the botanical gardens. Currently, the government is finding ways to promote the Renshan Botanical Garden to the status of a national heritage site. 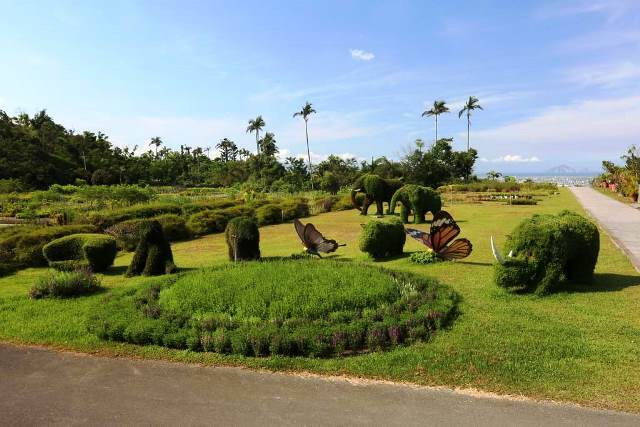 Indeed, the Renshan Botanical Garden has served as a green treasure vault that continues to beatify the Yilan County. Previous Post: « Xitou: What Is It Exactly?